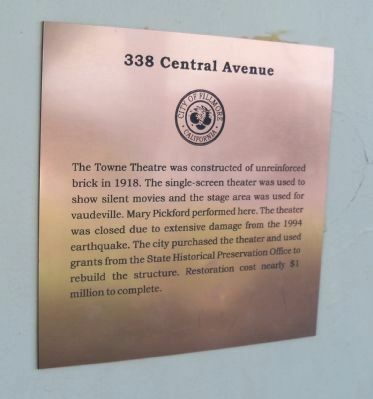 The Towne Theatre was constructed of unreinforced brick in 1918. The single-screen theater was used to show silent movies and the stage area was used for vaudeville. Mary Pickford performed here. The theater was closed due to extensive damage from the 1994 earthquake. 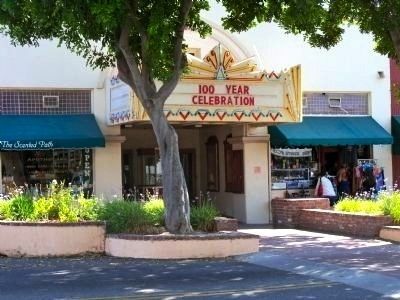 The city purchased the theater and used grants from the State Historical Preservation Office to rebuild the structure. Restoration cost nearly $1 million to complete. Location. 34° 23.99′ N, 118° 54.812′ W. Marker is in Fillmore, California, in Ventura County. Marker is on Central Avenue north of Main Street, on the right when traveling north. Touch for map. Marker is at or near this postal address: 338 Central Avenue, Fillmore CA 93015, United States of America. Touch for directions. shouting distance of this marker); Fillmore State Bank (within shouting distance of this marker); 362 Central Avenue (within shouting distance of this marker); 317 Central Avenue (within shouting distance of this marker); 364 Central Avenue (about 300 feet away, measured in a direct line). Touch for a list and map of all markers in Fillmore. More. Search the internet for 338 Central Avenue. Credits. This page was last revised on March 25, 2019. This page originally submitted on October 12, 2014, by James King of San Miguel, California. This page has been viewed 294 times since then and 8 times this year. Last updated on March 24, 2019, by Craig Baker of Sylmar, California. Photos: 1, 2. submitted on October 12, 2014, by James King of San Miguel, California. • Andrew Ruppenstein was the editor who published this page.